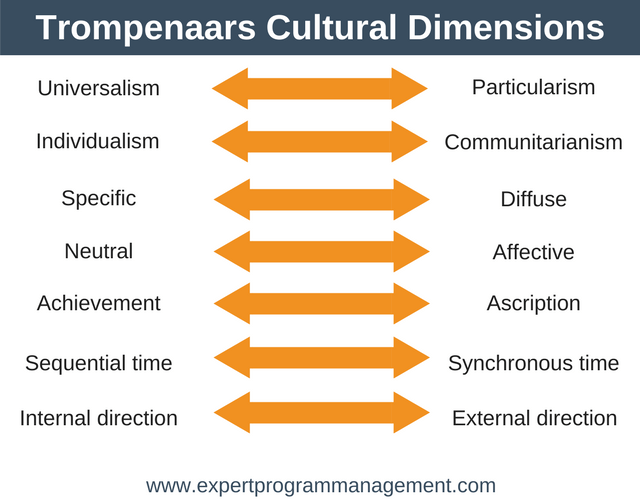 Trompenaars Cultural Dimensions Model, also known as The 7 Dimensions of Culture, can help you to work more effectively with people from different cultures. Business is becoming ever more global, and as a result of this, teams are becoming more diverse. Thus, we are likely to need to work with people from other countries and cultures. Most of the time things will go well when you work with people from other cultures. But when things don’t, and misunderstandings arise, Trompenaars Cultural Dimensions Model can help. The model was first described in the book, Riding the Waves of Culture: Understanding Diversity in Global Business. Written by Fons Trompenaars and Charles Hampden-Turner in 1993. To create the model, they surveyed over 40,000 managers from 40 countries. The book won’t help you to learn cultural etiquette. If that is what you’re looking for then you need a different book. The real advantage of this book and the model is that it allows you to step outside of your own biases and stereotypes. In doing so you can see how another culture might approach a problem. This can then prompt you with ideas to resolve any misunderstanding. Sequential time vs. synchronous time. Internal direction vs. external direction. Now let’s examine each of Trompenaars Cultural Dimensions in turn. This dimension can be summarized by asking what matters more, rules or relationships? Cultures based on universalism try to treat all cases the same, even if they involve friends or loved ones. The focus is more on the rules than the relationship. Universalist cultures include Canada, the U.S., the U.K., and Australia. Cultures based on particularism will find relationships more important than rules. You can bend the rules for family members, close friends, or important people. Each case has to be examined in light of its special merits. Particularist cultures include Latin America, Korea, China, and Russia. Explain the logic behind why you have made a certain decision. Invest in building relationships so you can understand the particular needs of others. Respect these needs as much as possible in your decision making. Call out specific important rules that must be followed. This dimension can be summarized by asking do we work as a team or as individuals? Do people desire recognition for their individual achievements, or do they want to be part of a group? Individualistic cultures believe that your outcomes in life are the result of your choices. In these cultures, decision makers make decisions and they don’t need to consult to do so. Thus, decision makers can make decisions at speed. It is your responsibility to look after your happiness and fulfillment. Individualistic cultures include Canada, the U.S., the U.K., and Australia. Cultures based on communitarianism believe your quality of life is better when we help each other. Thus, these cultures organize themselves around groups. There is a strong sense of loyalty within the group. As a result of this group tendency, decision making is slower as everyone gives input. Job turnover will be lower due to high group loyalty. The group gets rewarded for high performance, not the individual. Communitarian cultures include Japan, much of Africa, China, and Latin American countries. Reward and issue praise based on a person’s individual performance. Encourage people to use their own initiative. Align the individual’s need with those of the organization. Reward the group for high performance. Praise the group in public, but praise individuals for their contribution in private. Include the whole team in decision making. This dimension can be summarized by asking do we show our emotions? In a neutral culture, people tend not to share their emotions. Emotions are of course felt by the individual, but they are kept in check and controlled. Observing these people you would consider them cool and rational. Neutral cultures include Germany, Netherlands, and the U.K. In an affective culture, people tend to share their emotions, even in the workplace. In an affective culture, it considered normal that people share their emotions. Examples of affective cultures include Italy, Spain, and Latin America. Keep your emotions, both what you say and what your face says, in check. Remember that people are less likely to express their true emotions. So try to read between the lines of what people are telling you. After initial chit-chat, stay on topic in meetings. Use emotion to communicate what you want and your goals. Share how you feel to strengthen your workplace relationships. Learn some techniques to diffuse situations where emotions run high. This dimension of Trompenaars Cultural Dimensions Model can be summarized by asking how separate is our personal and professional life? In a specific culture, people tend to keep their personal and work life separate. These cultures don’t see an overlap between the two spheres. These cultures tend to be schedule focussed and direct and to the point in their communications. They focus more on the goal than the relationship. Examples of specific cultures include Germany, the U.S., the U.K., and the Netherlands. In a diffusive culture, people tend to see their personal and work life as interconnected. These cultures believe that objectives can be better achieved when relationships are strong. As such, in these cultures work colleagues socialize with each other outside of work more. These cultures are courteous and respect age, status, and background more. Examples of diffusive cultures include China, India, Argentina, and Spain. Organize agendas for your meetings. Stick to your agenda as best you can. Focus first on setting objectives for people. Your relationship comes later. Build your relationship before you start setting objectives. Expect invitations to more social occasions from colleagues. Commit to attending them. Expect to discuss business in social situations and personal matters in the workplace. This dimension of Trompenaars Cultural Dimensions Model can be summarized by asking do we prove ourselves to get status or is it given to us? In an achievement culture, you earn status through knowledge or skill. Job titles are earned and reflect this knowledge and skill. Anyone can challenge a decision if they have a logical argument. Examples of achievement cultures include the U.S., the U.K., Germany, and Scandinavia. In an ascription culture, you are given status based on who you are. This could be because of your social status, your education, or your age. You earn respect in these cultures because of your commitment to the organization, not your abilities. A decision will only be challenged by someone with higher authority. Examples of ascription cultures include Japan, Italy, and France. Issue praise to an individual in front of their peers. Use titles to refer to peers. If you wish to challenge the decision of a superior, handle this delicately. Pay extra care to show respect to your superiors. 6. Sequential time vs. Synchronous time. This dimension can be summarized by asking, do things get done one at a time or do many things get done at once? In a sequential time culture, time is very important. People like projects to be completed in stages. Time is money, and so it is important that each stage is finished on time. It is rude to be late for meetings in these cultures. Examples of sequential time cultures include the U.S., the U.K., and Germany. In a synchronous time culture, people see the past, present, and future as interwoven. Because of this people do several things at once, as time is interchangeable. This results in plans and deadlines being flexible. It also explains why punctuality is less important. Examples of synchronous time cultures include Japan, India, and Mexico. Keep to deadlines and commitments. Try not to deviate from the set schedule. Allow people some autonomy within the schedule. Allow time for people to arrive late to meetings. Be explicit, calling out any deadlines that are not flexible and must be reached. This dimension of Trompenaars Cultural Dimensions Model can be summarized by asking do we control our environment or are we controlled by it? In an internal direction culture, people believe that they can control their environment to achieve their goals. The focus is selfish (one’s self, one’s team, and one’s organization). Winning is important in these cultures and aggressive personalities are thus prevalent. Examples of internal direction cultures include the U.S., the U.K., and Australia. In an external direction culture, people believe that they must work with their environment to achieve their goals. In these cultures winning isn’t as important as maintaining a strong relationship. They focus on environmental factors e.g. relationships to achieve their goals. Examples of external direction cultures include China, Russia, and Saudi Arabia. Allow people to set their own (within reason) learning development plans. Allow a degree of constructive criticism. Rather than set goals, give feedback so as people can correct their course en route. Allow people autonomy to use their relationships to achieve results. First, self-evaluate that any misunderstanding is, at root caused by cultural differences. Second, score the person (not the country they are from) against each of the 7 dimensions. Third, examine those dimensions with the biggest score. Select from the tips provided for that dimension to attempt to resolve the problem. Note that there is a reason we score the person and not the country they are from. This is because within individual countries there are cultural differences from one region to the next. So we score the individual to avoid overgeneralizing. This is another model which can help you to understand cultural differences. You can learn more about Hofstede’s Cultural Dimensions here. Most of the time when working with different cultures things go fine. But when they don’t Trompenaars Cultural Dimensions Model (The 7 Dimensions of Culture) can help you understand why. And once you understand the root of the problem it’s possible to generate ideas to resolve it.